... come in through the main gate !! Genius Loci Travel is there to create your perfect vacation. For the right price ! If you have been looking for the perfect hiking or biking vacation in Italy, have browsed through many websites and brochures, and now you are convinced to have found the vacation which is right for you. But you still hesitate, because it costs you a fortune... Then please contact us ! Of course you will ask yourself whether this will affect the quality of your vacation. The answer is no ! an intimate knowledge of the country and a direct working relationship with all the best hotels and the best guides around. And as we have been in the market for many years, we have the best rates. Why pass through an American tour operator ? The tours we create here in Italy can be booked by you directly ! No intermediation fees. Learn more about our tours from Genius Loci website or contact us with your special requests for your trip. Genius Loci Travel has been creating hiking vacations for over a decade, for all the best tour operators worldwide. Today we are able to offer you the greatest choice of active holidays in Italy. Our strength is that we provide the best value for money. We aim for the best quality, and we don't cut corners in providing it. While luxury is sometimes certainly less important than the interest of an (undiscovered) area, we still always aim at the highest possible standards of comfort. N.B. 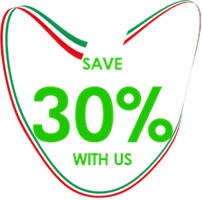 The offer 'Same tour, for 30% less' is valid for groups of at least four persons. Also check out our scheduled departure dates, consultable on our website page Small group Adventures.